Apply for the Sponsorship Program and Give Yourself a Chance to go Much Further! I’m Valdrin Gashi, a student at the Faculty of Arts here in Prishtina, third year. After a successful year in my profession, where IPKO Foundation played a huge part, I am writing this blog post to share my story to inspire you, the readers of this post, to follow your dreams and desires. At the faculty where I’m pursuing Opera singing (bel canto), we work long and hard to improve our vocal techniques, our breathing control, posture and how to perform in front of hundreds of fans and lovers of classical arts and music. And all this feast is not easy to pull. We constantly collaborate with other students and professors both here in Kosovo and other countries including Austria and Germany. 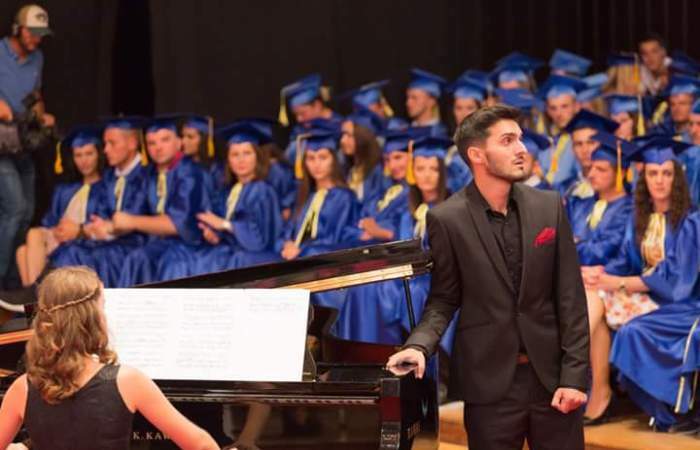 This past summer, I was part of the European Summer Music Academy held in Gjakova, where a team of over 30 musicians, performers, professors and students from Germany, Hungary, Albania visited Kosovo and performed the most enriching classical music compositions in front of the local audience. From them we learned a ton of things about musical performance and we networked with many of them and we actively communicate back and forth for potential collaborations in this field. Also, in collaboration with my fellow students, we have held a number of concerts throughout Kosovo where the audience praised us for our performance and encouraged us to think bigger than our hometowns and aim for the greatest opera halls of Vienna, Rome and Berlin. This warm encouragement really helped us to think outside the box and think beyond of this wall that we have here and plan to go even higher. The good news is that our concerts will reach audiences in even more cities of Kosovo and we are really close to organise a concert and perform in Tirana. We are doing all of this in hope that classical music will be part in the day to day life of people here, as it is a powerful music that can give you the deepest goosebumps and make your day amazing. And to top it all off, when the representatives from IPKO Foundation called me to announce that I have been selected as one of the scholarship winners, I simply just felt amazing. The financial support from the scholarship helped me to attend private tutoring classes from the best classical music performers and teachers here in Prishtina and Tirana where I’m improving my skills and preparing for the future opportunities. Singing is a fun profession, but it is far from being easy and not demanding. These classes are crucial and it would be hard to support them without the help from the scholarship, which I will be forever grateful to IPKO Foundation and all their amazing team. For me, this isn’t the first Ipko Foundation event that I have been part of. IPKO Foundation organises a ton of events that are filled with innovative content like DokuTech, Barcamps, Wiki Events and many more, where I made sure that I didn’t miss any of them, and neither should you! To end it, I am encouraging all of you from the bottom of my heart, to apply in this edition of the scholarship program and you will give yourself a chance to go further than where you are now. Never doubt yourself, but just do it!